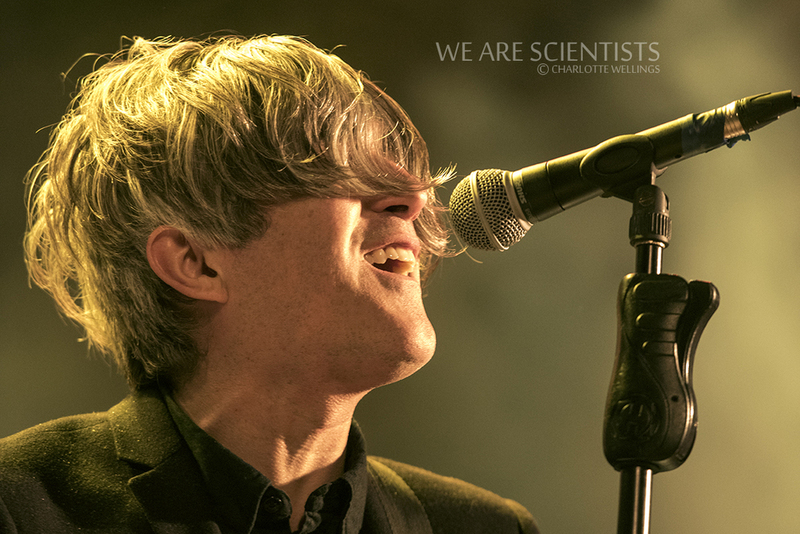 We Are Scientists brought their eclectic blend of pop, punk and indie-rock to Manchester’s Academy in support of Helter Seltzer, arguably their most intriguing studio album yet. The New York based comedic duo were supported by The ALIBI, a rock'n'roll band from Dartford and Flowers, a three-piece indie-pop band from London. The ALIBI take to the stage full of energy with their thrashy heavy riffs and strong vocals, they put on a smashing performance for the crowd as they come into the room, proving to be a great opening act as they motivate the audience to clap along and pump them up for the show. They are undeniably, and to the joy of the audience, an unruly bunch. The crowd cheers as the bass player climbs on to the speakers, security rush in and consider stopping their set. Fortunately they are allowed to continue and pull some great tunes out of the bag. The audience laugh along as the lead singer breaks into …only you, can make me feel this way… from the pop song Only You (And You Alone) by The Platters. There is an intensity to the lead singer that makes the band a delight to watch, they are definitely one to look out for! Once Flowers hit the stage they seem like an odd choice for a support band. Their sound is sombre and completely the opposite to The ALIBI, who geared the audience up with their loud, fast tempo only to have them brought back down again with Flowers mellow sound. Rachel, the singer, has wonderful melodic vocals backed by a heavy beat, and soon you're lost in her performance; she seems sweet and nervous but performs beautifully. The bass player however looks miserable, performing like he doesn't want to be on stage. Rachel thanks the audience with two songs left to play and continues to wow us with some incredibly high vocals. For the last song a solitary spotlight shines down and the attention falls solely on her, this is how it should have been for the whole set as she deserves to be centre stage. The band start their show with a recording of This Scene is Dead. The crowd are full of jubilation as the band kick into their set, playing the new debut single Buckle, the opening track to Helter Seltzer. The intensity and boundless energy of vocalist Keith Murray is exhilarating to watch and the bass player Chris looks more full of swarve and swagger than ever. Well known for incorporating comedy into their gigs, the audience do not have to wait long for the jokes to start. A fan states this is my third time seeing them. Not only do they rock but they throw in a comedy double act for free, just superb! as Chris starts messing around with his bass. Kinda sounds like I'm trying to rev my engine, at least a lawnmower engine and plays noises to demonstrate. Keith jokes it was all running well until he pulled the show to a halt with his noises, the audience are clearly enjoying the banter. He starts joking around with his bass again and everyone cheers. Keith asks the audience are you all just cheering so he'll stop and get on with the gig? (laughing). He starts a patronising clap, mocking Chris, Chris that was magnificent...we'll take a break and play a song and then come back to the engine noises OK? They break into It's a Hit from album With Love and Squalor. Blazing through their 19 song set-list, We Are Scientists put on a fun, passionate and silly performance. They then perform Classic Love, also from the new album and a large proportion of the audience sing along even though it has just been released - the crowd are the nice guys and Keith responds by blowing a kiss to them. Give yourself a pat on the back he says to the audience and then continues to state that sometimes when they tour there are very few people in the room at some gigs and how happy they are to see a full room of fans cheering tonight. Ready for the encore Keith lay his guitar down and creates a feedback loop that continues to run until they return to the stage. When he re-enters the stage he says Now this is going to to sound weird...are you all hearing daemons from hell, in a good way (laughs). Chris plays a heavy bass-line and Keith comments about how there is a crazy sound on stage, it appears there may be a technical problem with one of the speakers. He continues to joke check out the new single online, we might not be able to play it now, maybe this songs supposed to be so deep you'll crap your pants. They play the track and during it Keith sings your supposed to ignore it whilst pointing towards the bass grinning! We Are Scientists play with a huge amount of passion and energy, it was a truly refreshing gig. They have a unique way of making the audience feel full of joy with their comedic double act and upbeat music and tight performance.